The First World War, despite being one of the most important events in world history, has been comparatively overlooked by video games. This may be due to its successor having a much less sombre image in popular culture, and hence more opportunity to uppercut Fritz and his Axis mates. So already Valiant Hearts is subverting expectations; being a 2D adventure game with an art style comparable to Charley’s War, if it were written by Hergé. The game discards the usual cover-based shooting setup characterising most war games, instead opting for a “pick & mix” of various game modes. Usually, the game follows typical adventure game puzzle solving in a 2D environment. At other times, however, the player will be in a car, dodging obstacle in time to music; or following button prompts to perform surgery. This may seem a bit of a mess, but it actually mixes surprisingly well with the story. A particular example is when the player is driving a taxi full of French soldiers to the Marne (which was based on an actual event), jinxing past obstacles in time with the Can-Can; looking forward to getting to the front to give Jerry a damn good thrashing. When you actually get to the front, you are greeted with the putrescent stink of corpses and any notion of glory in warfare is lost as you rush to the aid of the wounded. Rather than being inconsistent, this juxtaposition further serves to set Valiant Hearts apart as a game about war. Whilst most war games use the setting for run-gun-fun, Valiant Hearts is less about the Great War itself than it is about those who took part in it. Most of the characters in the game would rather just go back to how things were before, but are unable to escape being drawn inexorably back into the conflict. This struggle is what drives the narrative, and elevates the cast above the cardboard cut-outs ubiquitous to war games. 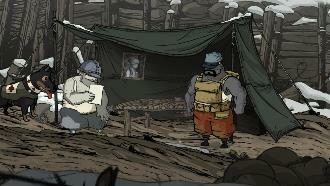 Posted in Arts and tagged game, game review, valiant hearts. Bookmark the permalink.